Lately I've been fortunate to score a bunch of Herschel cards that I've been missing.. 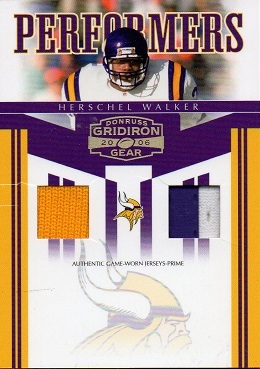 Among them is this 2006 Performers Jersey Combo from the Donruss Gridiron Gear series. This card is #9 in a serially numbered run of 20. 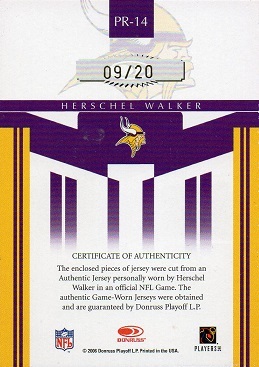 There are 11 different versions of the 2006 Gridiron Gear series that feature Herschel, including autographed and memorabilia cards. I now have six in the Hoard. Congrats on the low numbered multi colored patch card.